Step into the perfumed parlors of the Everleigh Club, the most famous brothel in American history—and a catalyst for a culture war that rocked the nation. Minna and Ada Everleigh, the two sisters who operated the Club at the dawn of the last century, were unlike other madams: The Everleighs made sure their girls dined on gourmet food, were examined by an honest physician, and even tutored in the literature of Balzac. Rival madams in Chicago's Levee hatched numerous schemes to ruin the Everleighs, including an attempt to frame them for the death of department store heir Marshall Field Jr. But the sisters' most daunting foes were the Progressive Era reformers, who whipped the entire country into a frenzy with lurid tales of "white slavery"—the allegedly rampant practice of kidnapping young girls and forcing them into brothels. It was a furor that shaped America's sexual culture, and had repercussions all the way to the White House, including the formation of the Federal Bureau of Investigation. 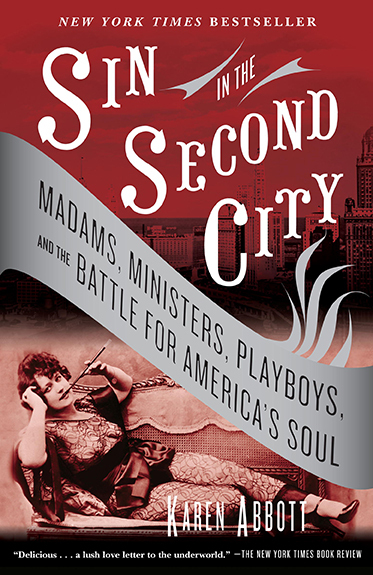 With a real-life cast of characters including Jack Johnson, Edgar Lee Masters, John D. Rockefeller Jr., William Howard Taft, and Al Capone, Sin in the Second City is a colorful, nuanced portrait of the iconic Everleigh sisters, their world-famous Club, and the perennial clash between our hedonistic impulses and Puritanical roots. Culminating in a dramatic last stand between brothel keepers and crusading reformers,Sin in the Second City offers a vivid snapshot of America's journey from Victorian era propriety to 20th century modernity.